Keith called us up and left us this message to thank us for our service. We wanted to share his kind words with all of you. Thank you Keith we appreciate your support and kind words! Enjoy your Delta 36-855 Stock Feeder. Just wanted to let you know how wonderful I think your service is. My son-in-law never, ever asks for anything for Christmas, except this year. 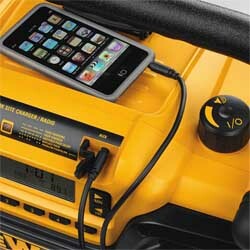 The DeWalt Radio DC012 for his iPod. I couldn't get it anywhere and then found out it wouldn't be available until January. Kept checking all of the big places, Home Depot, Lowes, Sears, nothing. Then while checking out other sites on Jan. 4th, I found your site. Since I don't order tools or equipment I was not familiar with your company, but I placed the order. The whole process was great. Not only did I get a confirmation order immediately, but there was also a physical address and phone numbers in case I had a problem. Yesterday the 6th, I received a phone call from Peter. He wanted to make sure that the order was going to the correct address, since the billing address was different. He also told me it should be delivered by today. He was right!! Great Customer Service. Thank you Peter. PS...My daughter just called to say that her husband was leaving his job site to come and pick up the radio. I guess he really did want it. Had the screw gun I wanted at the best price online and in stores, shipped promptly and arrived in good shape. They use UPS and provide a tracking number so you know where your order is. The tool was new and as advertised. I've definitely bookmarked them to use again! Their prices are usually the lowest. They are up front about items that are out-of-stock. If you order a back-ordered item they give you the option of two shipments or to hold shipping until the backorder clears. I chose hold and the whole order shipped a few days later. Their shipping is just plain cheap. At $6.50 per order they charge the least and they ship UPS Ground which usually means 4 days. I called customer service and the 'expert' on dual motion buffers and buffing pads was at lunch. They said he would call me back. (Have you heard this one before?) Sure nuff, he called me back and was an expert. He answered my questions clearly and offered options and suggestions. I give that a FIVE! Glenn from Miles City, Montana sent Jeanne these roses just for being nice... there are few truly special people in this world and Glenn would be there right at the top. 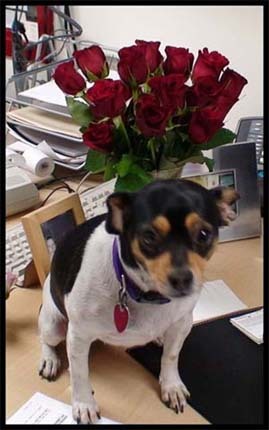 Thank you for the flowers Glenn, Lucy wanted to say thank you also. You run one fine operation. I want you to know that Dave in your sales area is top notch, friendly, and obviously a dedicated worker. 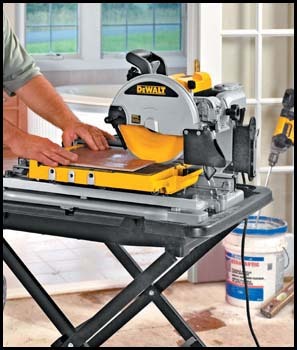 We called this morning with a very defined expectation of getting our DeWalt D24000S 10" Wet Tile Saw for a job we must finish next weekend. He dug into the various logistics issues and from where we sit, went above and beyond to meet our request. I will tell you this - - we went to your competitors and they could not hold a stick to Dave and your organization. We will be telling our friends about your organization. The price was so good I almost thought it was too good to be true and had second thoughts about ordering. But after reading other reviews I took the chance and have no regrets. Items arrived promptly and well packaged. I will be ordering from them again in the future. Really good experience. Items I needed were temporarily out of stock. I requested to be notified when items were back in. Only a day or so and I received a back in stock notice. Their web site is easy to search, and convenient to ask for a notice of back in stock. Easy, Easy, Easy. The prices were the best I found on the internet, and shipping was fast. I really couldn't have asked for better service. I will shop with them in the future, and would gladly recommend them as a great place to find hard to find tools with excellent pricing. Thanks for a job well done! 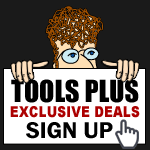 I have been looking for an affordable ferrule crimping tool for years. All I found was outrageous prices. One day I happened across your site, talked with Debbie and am now the proud owner of a Coilhose CV500 ferrule crimping tool! Debbie as with the others I dealt with were very polite, cheerful and very helpful. 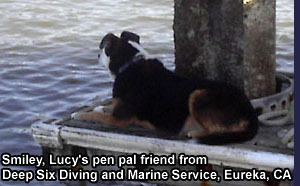 By the way Lucy, my dog Smiley saw your pictures and say's "HI". LOL! You people are the best! You have my business!